Blurring the line between a narrative movie and a documentary, Actor Martinez is a film experiment that’s difficult to unpack but hilarious to watch unfold. After a man opens his life up to a pair of indie filmmakers, Actor Martinez cunningly navigates between documentary and narrative to question its star’s true nature, as well as the concept of self-presentation in life as well as film. Arthur Martinez first appears in Nathan Silver and Mike Ott’s new film as the subject, but through the co-directors’ persistent manipulation, Arthur seems increasingly at the whim of this fascinating, perplexing film experiment. From the opening frame, co-directors Ott and Silver appear on-screen to interrogate Arthur. They’re out of focus and their voices are laid on top of the opening shot in a way that alludes to their influence on the rest of this film; though Ott and Silver won’t always be visible, their presence adds a layer of subjectivity to any character’s portrayal. Mostly, that character is Arthur. Designed to fudge the gaps between fiction and reality, Actor Martinez begins with brief glimpses into Arthur’s life as a weed-vaping computer repairman, involved in Denver-area film events as an actor and promoter. In both appearance and demeanor, Arthur isn’t a typical leading man. With thinning hair and a slightly nasal tone to his voice, Arthur’s outgoing disposition takes on a discomforting quality through Actor Martinez’s lens. 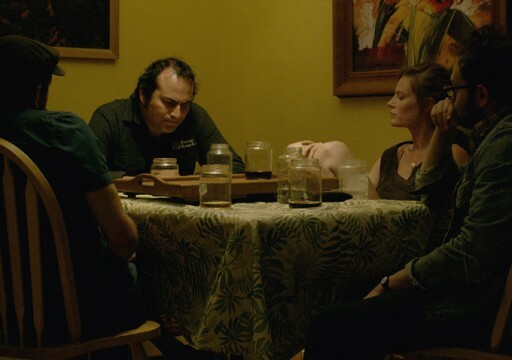 Unfolding slowly, Actor Martinez is largely told through long takes in which Arthur responds to the filmmakers’ questioning sitting across from each other at a kitchen table. Many other scenes show him among the Denver film community or practicing jiu-jitsu alone at home, with the interview audio laid over the footage. Each of Arthur’s uncomfortable interactions – from a small conversational miscommunication to a tense confrontation with an actress about her audition – lingers just long enough to be become hysterical and awkward. Arthur’s blunders would seem Michael Scott-esque if they didn’t feel so familiar. How much is real here can’t quite be defined. The movie exists in a mind-bending realm between honesty and performance, and it blurs the lines just enough so that you feel on the verge of seeing the full picture until it morphs again. Each newly introduced element adds a new layer of compelling questions. The puzzle doesn’t seem to want to be solved. Actor Martinez takes on more enigmatic layers with the introduction of Lindsay Burdge as Trish, or Lindsay, or herself and Arthur’s new girlfriend. Having an additional subject allows the filmmakers to deploy Lindsay against Arthur; however, Lindsay, too, becomes entangled in the complexities of Actor Martinez’s meta-narrative. Whether it’s by the actors’ own design or it’s done at the (occasional off-camera) prompting of their directors, Arthur and Lindsay’s prodding of one another forces unexpected, genuine reactions in the middle of otherwise manufactured moments. Piecing together the experiment is intermittently engaging or frustrating. Ott and Silver continue to shift their agenda to keep the dynamics in a state of constant change. The experiment creates several shocking, captivating turns, although the livewire momentum isn’t completely sustained for the 75-minute runtime. Yet, at its best, Actor Martinez can craft subtly subversive commentary on the treatment of actresses in film – as the movie does throughout the casting session for Arthur’s girlfriend. Despite the movie’s loose structure, cinematographer Adam J. Minnick captures the action through stunningly resourceful long shots. Through slow, surveillance-style zooms, the film takes on a voyeuristic quality that lends to the unsettling atmosphere throughout. The zooms are a well-deployed comedic tool as well, suddenly jutting forward to highlight a strange mannerism or catch an actor walking away in a huff. Initially, Arthur had approached Mike Ott at a film festival hoping to appear in one of the director’s projects. It’s hard to imagine that Arthur could envision this movie as the result of that conversation. Actor Martinez simultaneously creates a textured character study while forcefully rejecting the notion of authenticity in the framework of subjective filmmaking.